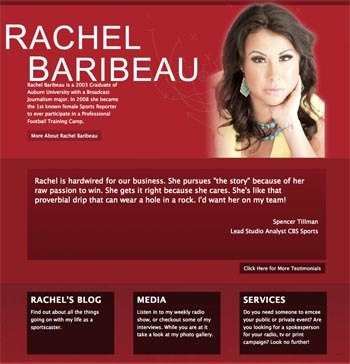 Samford’s Journalism and Mass Communication Department will welcome sports reporter Rachel Baribeau to campus Nov. 2 for a lecture promoting the new sports media minor. The lecture, “My Life as a Multimedia Sports Journalist,” will take place in Samford’s Brock Recital Hall at 6:30 p.m.
Baribeau is the first known female sports reporter to participate in an NFL training camp. She has reported for Fox Sports, ESPN, College Sports Nation, Bleacher Report and other major sports media outlets. The lecture will be open to the Samford community. High school journalism teachers and prospective students interested in the sports media minor are also invited to attend. More information about JMC and the sports media program will be available after the lecture. Before the lecture, Baribeau will spend time with JMC students to answer questions about sports media careers. This event will take place at 4:30 p.m. in Divinity South 013. There will also be a reception for Baribeau at 5:30 p.m. in the lobby of Brock Recital Hall. The Samford journalism and mass communication department offers tracks in print journalism, broadcast and electronic journalism, PR and advertising. The department also houses a film production minor.